Information Technology growth has gone beyond all imagining in the last twenty years. Whether you call it a Moors law or it all started from mainframe computers, now we are talking about wearable technology like the Apple iWatch and Google Glasses. More precisely, if we look back on hardware side, for the masses it was all triggered from the Apple Mac and then Compaq and Dell. Windows made it easy to operate computers, and on the software/Internet side I think it all started with Netscape and Yahoo, who made World Wide Web access a household commodity. Thereafter, Amazon, eBay, Google and now Facebook and Twitter are taking it to the next stage. Anyway I am not writing this post to look into the history of technology growth but have discussed below how these changes have made businesses review their marketing and business development campaigns, or in other words why every business, from big FTSE 100s to start-ups to individual professionals, is becoming a media company regardless of the nature of their business, and forced to produce digital content in order to thrive in their area. The main factor causing companies to produce content continuously is a surge in mobile and social media platforms, which means if businesses really want to reach their audience they have to produce social media and mobile friendly content, which should be more frequent, engaging and easily available than before, due to mobile and social network’s real time and community-driven framework. Businesses cannot sit on one piece of content like the old days of TV advertising, print media and to a certain extent websites, and then apply techniques to promote them; rather, they should continuously produce more and more content so that they have their digital presence in the right time and right place for consumers. And to substantiate my thoughts on how content is consumed these days, I have linked to the latest BuzzFeed analytics report, which shows the increasing influence of social media and mobile devices on content distribution and consumption. If we summarise, the main findings are that most referral traffic now comes from social media networks, more than Google, and is largely consumed on mobile devices. People are watching videos on channels like YouTube, and more on mobile devices than TV. Another side to the surge of social networks is that people talk 24*7 on any topic from all around the world, which means brands have to be vigilant in out of office ours to make sure their reputation remains intact. For example recently Sainsbury’s charismas ad launched primarily for TV but also got over 14m views on YouTube with over 17k mentions across various networks from social media to blogs etc. The Guardian post alone initiated over 900 comments. The ad got traction because of its controversial content and attracted some criticism from analysts for its insensitivity to WW1 veterans, but the point here is that Sainsbury created an ad which become the talk of the whole world wide web, and then to manage reputation Sainsbury has to keep track of all the networks via comments and reviewing. So for the company, work don’t stop at creating an ad and broadcasting it on telly, and then issuing a press release to deny any wrongdoing and pull the ad from television networks, because the ad is already out there on YouTube, people’s Facebook and Twitter feeds and embedded into online blogs. The work, in the form of producing more content to manage reputation, continues until the dust settles. Product development now has become a public event. These days companies release beta versions as soon as they come out of their labs and in fact crowdfunding sites have taken this one level above, where businesses pitch their ideas to get funding and feedback, and it’s not limited to start-ups now, as recently Sony’s rumoured Smartwatch was cited on a crowd funding site to not only raise funds but get instant feedback from various interest groups. And we all know that putting a project on crowdfunding sites needs a substantial content production. One can argue that the above two examples belong to the retail sector, which is always prone to customer engagement, and the recent surge in social media and mobile platforms has obviously caused a natural progression and shift towards becoming a media company. But, we can also look at hard-core enterprise businesses that have no direct engagement with consumers in their day-to-day operation, like Petrofac and BG Group. Both are oil exploration companies and they are not household names, but I was looking at their websites and social profiling and these companies are also working rigorously to build their digital footprint with their own Facebook, Twitter, YouTube and LinkedIn pages. Their analysts write rigorously on industry forums and become influencers on LinkedIn. The reason for their content creation is to attract the best talents from industry, and also pre-emptive damage control for things like oil spills, share price hiccups etc. 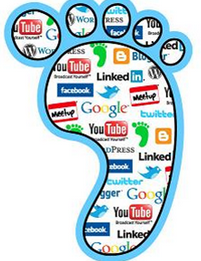 A digital footprint has become a prerequisite for any start-up or entrepreneur to take their proposition further, because from VCs to consumers, their continuous communication via various social networks is expected. This means you see start-ups and entrepreneurs continuously blogging, publishing articles on LinkedIn and their Facebook and Twitter feeds, engaging and broadcasting nonstop to ensure their noise is being heard and that they are noticed by the right people.